Download Our Data Recovery for Free to avoid losing data when you fix your computer problem. The Disk is Write-protected on USB Flash Drive? 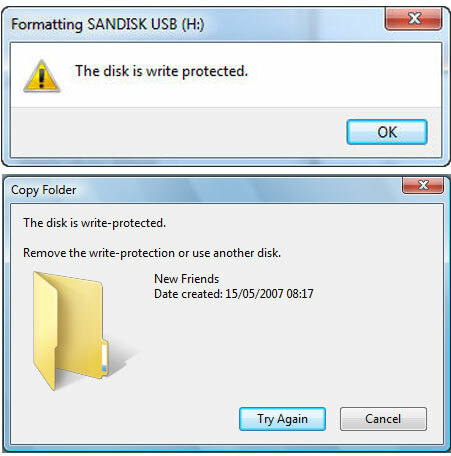 The common error of "The disk is write protected" will occur when you trying to format an external disk such as (USB flash drive, SD memory card or pen drive), you start to copy or modify the files on the drive, the pop-up window show you “The disk is write-protected. Remove this write-protection or use another disk”. How Deal with the Write Protection External Disk? If your USB disk get this error on Windows computer, you may think the USB drive is broken and unable to use. The flash drive become read-only situation, and cannot manage like copy, deleted or write the files on the disk. How to remove the write protection from ready-only flash drive? On the next guide we will show you how to remove write protection from USB drive, SD memory card, pen drive in Windows 10/8/7. Step 1. 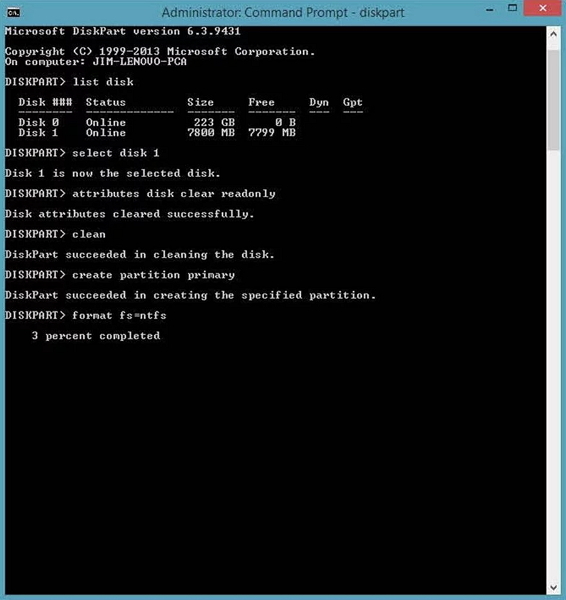 Connect your flash drive to the computer, and launch a command prompt by searching for cmd.exe or 'Command Prompt' in the Start menu. After this your USB flash drive should now works well, if it doesn't work, you can also follow the next solution to fix write protected USB drive with Regedit.exe. Step 1. 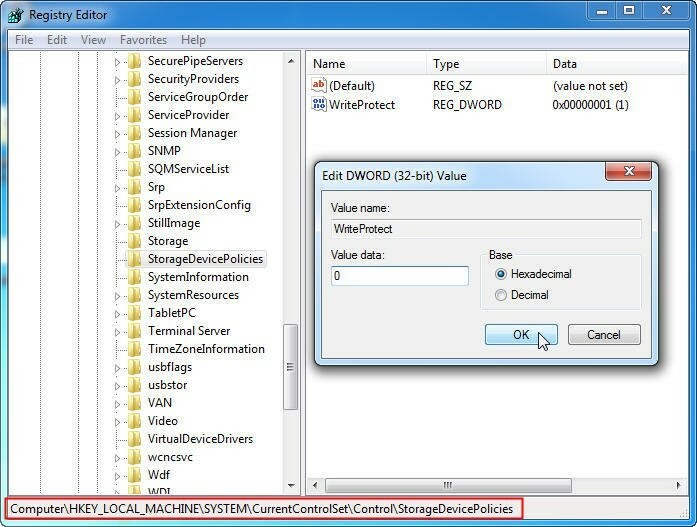 Press key of Windows Key + R and type regedit in RUn dislog box and Enter. Step 3. Double click the WriteProtect value in the right pane. Step 4. You can change the value data from 1 to 0, then click OK to save the change, and close the Regedit window. Step 5. Restart your computer and connect the USB drive to it. To check the drive if working well and no longer write protected, continue to use the USB flash drive. Step 1. Plug in the write-protected disk. Step 2. Press "Windows+E“ and right click on the drive. Step 3. By right-clicking on the disk, you can choose "Properties", and then select "Security". Step 4. 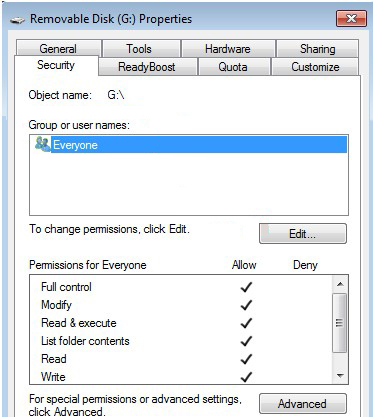 To Edit the permissions, you should now select "Everyone" from "Group or user names". Step 5. Select "Edit" and go to "Permissions"
Step 6. Check all the boxes labeled as "Allow"
Step 7. Click "Apply" and exit. Your disk's write protection has now been removed. Check the switch on the drive: some external USB flash drive and pend drive have a mechanical switch which is used to lock or unlock the drive. If your drive got a one switch, to check whether the switch lock or not and move it. You also can check the USB flash drive if it got the virus infected and attacked. You need to download anti-virus software and can your flash drive. Once the virus is found, and kill it at once to remove write protection from read-only flash drive. If you working on a Mac computer, you also will receive the error "Read Only" external drive on your Mac. On the following steps we will show you how to remove write protection disk on Mac, then the drive will work just fine with both Mac and Windows systems. Step 1. Open the Disk Utility, and the application window will open. Step 2. 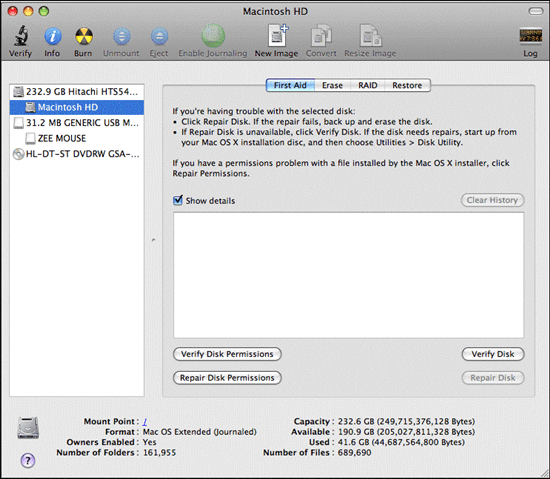 Click on your USB flash drive on the left pane of Disk Utility. Step 3. Click on the Erase tab, then select the format type. Select either “MS-DOS File System“ or “exFAT” both work well on Windows and Mac. Step 4. Then click "Erase" option to start formatting the USB flash drive. To checking the drive's permissions if corrupted or not. You can fix the error using Disk Utility. Follow the steps as below to remove write protection from Read-only USB drive on Mac. Step 1. Go to the Disk Utility in the Utilities folder. Step 2. Select the device which is ready-only need to remove write protection. Step 3. Click on the First Aid and the OS will start to scanning your drive. We hope those solutions could help fix and remove write protection from USB drive on Windows and Mac. Or it fails to fix out the problem, you should buy a new USB flash drive. Also, what if you need get all USB data back, you can get download the powerful USB data recovery software to help you out. Download Recoverit Data Recovery and follow the guide to recover files from USB drive easily. Dwwin.exe - DLL Initialization Failed? What should You Do?